It has to be said that Daniel's team has made amazing progress with the administrative interface. The new UI looks very slick, and Tony Lee's logo design fits it very well. The user interface is also using our NemeinLocalization library. As soon as the language strings are included in the build I will translate them to Finnish. In addition to translations, the first glitches we've noticed have been the "This is the place where we will put a DocBook created HTML documentation for SpiderAdmin" message and some oddities with move commands. All in all, very good work! 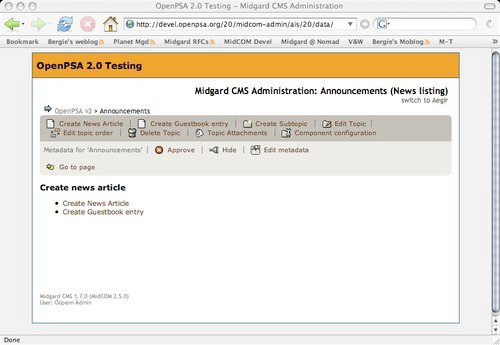 I'll keep this updated on how our "living without Aegir" project with OpenPSA development goes. 28 February 2005. 1 minute read.